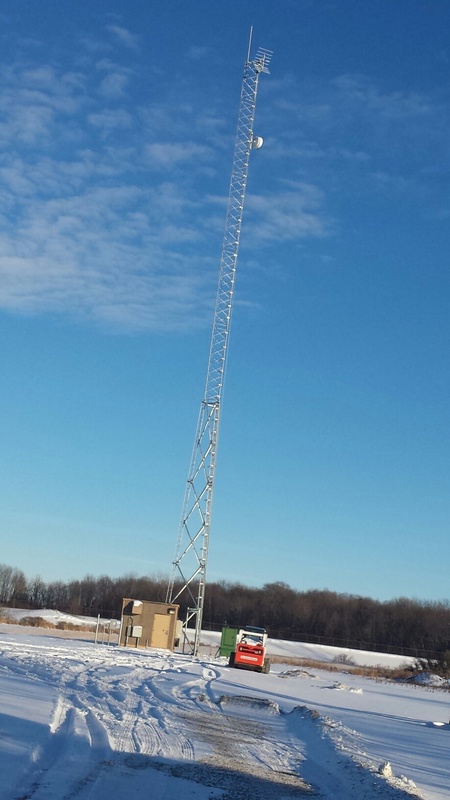 The paging tower in the Village of Clifford, Burlington Township has been erected. Crews from E.R.S., Pyramid Network Services and Motorola worked through the bitter cold to construct the 160′ tower and the site ground work over the last few weeks. DTE Energy is expected to bring electricity to the site possibly by the end of this week. Once hooked up, Blumerich Communications and Motorola engineer’s can install the equipment and bring the site online. The shelter and generator used in Clifford are the same ones that were used in Imlay City on the old radio system. By reusing them, we were able to save money in not having to purchase new ones. This northern site is set up to be a directional site radiating RF in a southerly direction bringing in much needed VHF coverage for fire and EMS personnel in the north part of the county.